I originally baked these for Bread bakers, but couldn't get the post up on time. They follow a strict time, so cannot be lazy as i m for BM's. Though the bread was ready, i was too lazy to sit and edit the post. As i already had enough tension to grey my hair, i decided to drop out last minute, saving a few strands. A pretty easy rolls to bake and loved the aroma of ajwain leaves along with mint, coriander and rosemary in the rolls. Another speciality is all the herbs are from my garden. The original recipe i referred used butter, since i didn't have unsalted butter, i used oil, if you have butter in hand, please go ahead and use it. There is absolutely no substitute for buttterrr!!! 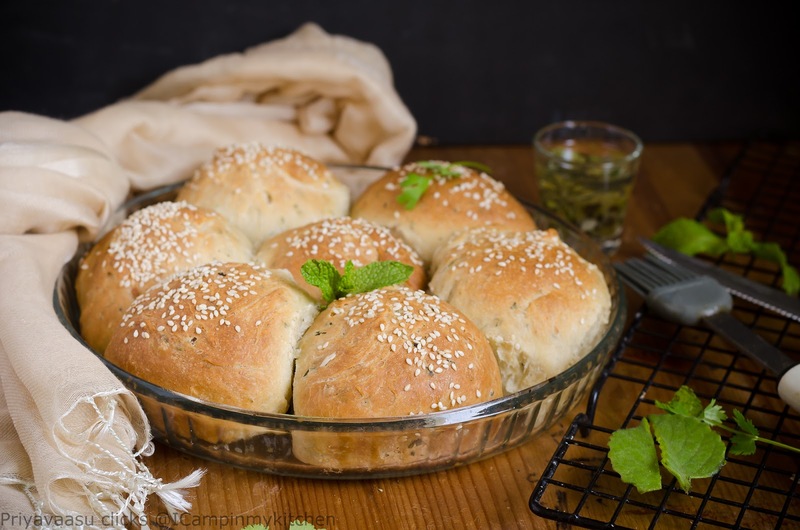 I m sending these rolls to Kids Delight - Brunch ideas, hosted by me, event by +Srivalli Jetti. I used my food processor to make the dough. Take flour, sugar, yeast and salt in the processor bowl. Run it for 30 seconds for the ingredients to mix. Chop the herbs and garlic into fine piece. Add 2 tbsp of chopped herbs to the flour mix along with garlic. To the remaining herbs, add 1/4 cup of warm oil. It can be used for brushing the rolls and also for baking bread later. Mix Warm water with buttermilk. Now slowly add this liquid-mix to the flour and start kneading a soft dough. You might not need all of the liquid, so add slowly. I was left out with 2-3 tbsp of liquid. After adding liquid, add oil and knead for another 3-4 minutes to get a soft and smooth dough. Remove the dough to a well-oiled bowl. Let it rest for an hour or until it doubles in size. Once doubled, punch down the extra air from the dough. Dust your work area with flour, roll the dough into a log, using a sharp knife, divide the dough into 7 or 8 pieces. I divided into 7 portions. Roll each portion into a tight ball, place it on a greased baking tray. I used by 9 inch pie pan as baking tray. Let the rolled balls rest for 30 minutes, Preheat the oven to 200C. Brush the rolls with the herb oil. 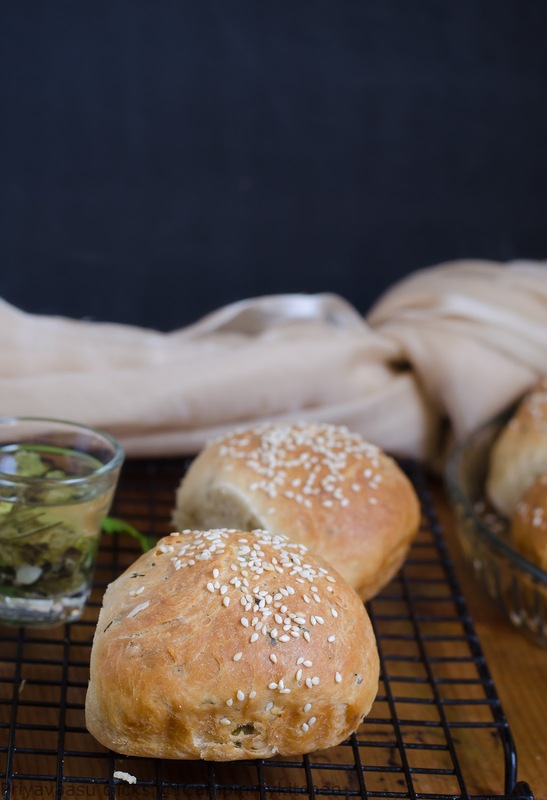 sprinkle sesame seeds and bake @200C for 30 - 32 minutes. If you feel mid-way the tops are turning brown fast, then dent the rolls with aluminium foil and bake. Remove the rolls onto a wire-rack, let it cool completely. serve it some warm soup or a spicy gravy for a filling meal. Herbs in bread are always a great addition. Nicely done. The buns look amazing... So soft and pillowy! The buns look so divine Priya..very nicely baked! 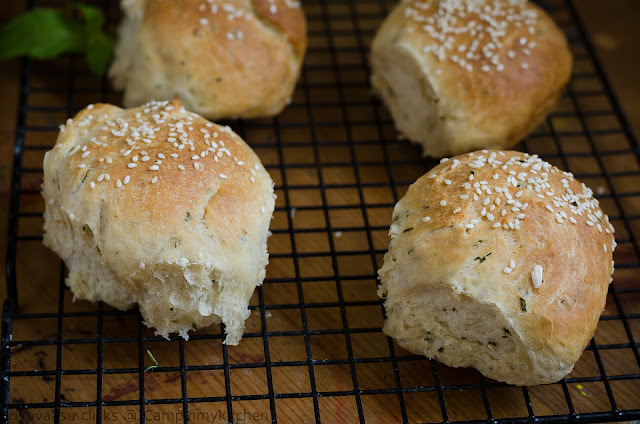 My kind of buttermilk rolls, i love it to the core, they came out simply awesome. I know your breads always come out excellent , this one is no exception . Planted herbs on the balcony yesterday. Excited about the day they will make it to the blog :D. Bread looks superb! Planning to go with this one Priya. Will ping you with questions later. Yummy yummy looking buttermilk rolls Priya. They turned out great. These rolls look absolutely delightful Priya. 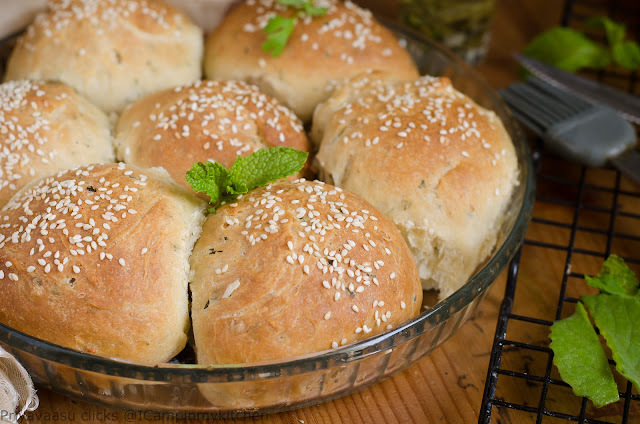 Always love the addition of herbs in breads..
Buttermilk rolls looks so soft and delicious. Tempting looking rolls, Priya. Love the texture. garlic and herbs - this must taste delicious - perfect with a plate of pasta!